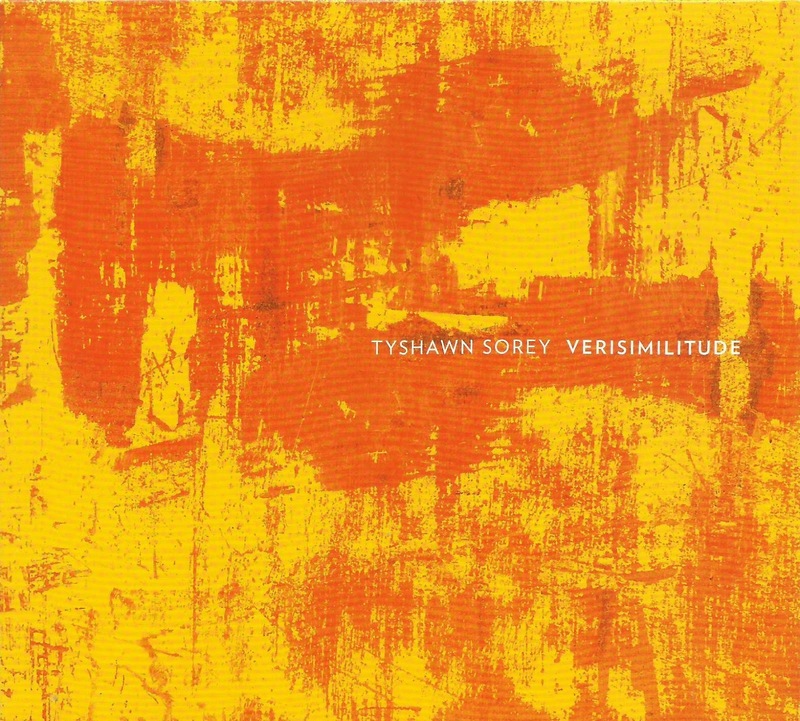 It's only been a year and a few weeks since I reviewed The Inner Spectrum of Variables, Tyshawn Sorey's two-disc suite of music for piano trio with string trio. During 2016, he also premiered a composed work titled "Josephine Baker: A Portrait" at the Ojai Music Festival, which made the New York Times' Best Classical Music of the Year list after it was performed at Lincoln Center. His trio debuted at the Village Vanguard (which now seems to be synonymous with greater acceptance for adventurous musicians like Sorey and Mary Halvorson, who also performed there in recent months), and played the Newport Jazz Festival. This year also saw a return to Ojai, reception of his Doctorate of Musical Arts and the beginning of his Assistant Professorship at Wesleyan University. Of the five pieces on Versimilitude, two were commissioned for last year's Newport Festival. But the way the music flows from track to track - moving at a languid pace, rising and falling, staying in one place at length - it comes across like one larger, captivating work. The pauses between tracks don't last long, but all the open space amidst the compositions makes any more breaks unnecessary. "Cascade in Slow Motion" lives up to its name, with pianist Cory Smythe playing simple eighth-note figures (rhythmically similar to Monk's "Misterioso") over Christopher Tordini's bass lines. "Flowers for Prashant," dedicated to filmmaker Prashant Bhargava, plants itself on rolling piano chords which Smythe embellishes with single-note additions in the right hand. Beautiful in its execution (Smythe's technique adds to the dynamics) it makes a rich melody out of simple figure, packing all the emotion of the subject matter into it. "Obsidian," the other Newport commission along with "Cascade," also begins with spare, loopy electronics, not fully catching fire until well past the halfway mark of its 18 minutes. Sorey switches from woodblocks to trap kit, with Tordini rumbling below him, and they start to build, while Smythe hammers away at a low, thunderous chord beneath them. The rise in volume doesn't last, but this doesn't imply an anti-climax. Suspense has been created, and the trio has you hanging on every note and gesture, wondering what were those eerie closing sounds (bowed drum heads?). Think about it too long and it's easy to miss the fact that "Algid November" has begun with spare piano chords. This might be a remote comparison, but early moments during the 30-minute track recalls the explorations that pianist Lowell Davidson recorded for ESP-Disk' with Gary Peacock and Milford Graves in 1965. It also got me thinking of Thelonious Himself, the solo session where Monk struck chords in a haunting, halting manner, as if he was unsure of them. Most of the focus remains on Smythe, who sounds like he utilizes electronics again, as notes cut off unexpectedly, like an edit has been made. He eventually begins repeating a note in the upper register, while unleashing chords and fragments with his other hand. This brings the trio to a boil until Sorey brings things down with an extended toll on the gong. And that's only two-thirds of the way into the piece. While those four tracks could have satiated the intriguing listener, Sorey has another quarter-hour piece with "Contemplating Tranquility," which flows right out of "Algid November" with more gong rolls. It's safe to say that nothing like these last two pieces has ever been heard at the Village Vanguard, where he debuted them. Who knows where Sorey will turn up next (he's appeared on albums by Roscoe Mitchell and Vijay Iyer recently too). But all that is secondary right now. Verisimilitude requires - actually it demands - multiple explorations. And it should be done from various angles and systems. When I listened in the car, I noticed Smythe's toy piano parts. Listening as I write this, Tordini's contributions stand out in greater relief. Short of giving play-by-play descriptions of everything, there's little more than can be said right now. And I don't want to spoil anything more than I already have. Once upon a time, it was an element of an album that was taken for granted. Songs (tracks, or tunes, if you rather) were placed in certain spots on an album for dynamic effect. A term even existed for the tracks mid-way through the side of a record that gave the listener a jolt to maintain their interest. They were called tent songs. It made perfect sense and was such a revelation to these ears because, without knowing the lingo, I noticed that happening on my band's first album. Aside from that, running order creates a "wow" factor, or in some cases a "yeah" or "damn right" factor. Think of the energy at the end of "Good Morning Good Morning" and the way it leaps into the upbeat drive of the "Sergeant Pepper" reprise. Or, on the same album, the way "Being for the Benefit of Mr. Kite" wipes away the melancholia of "She's Leaving Home," going on some new wild trip in the process. 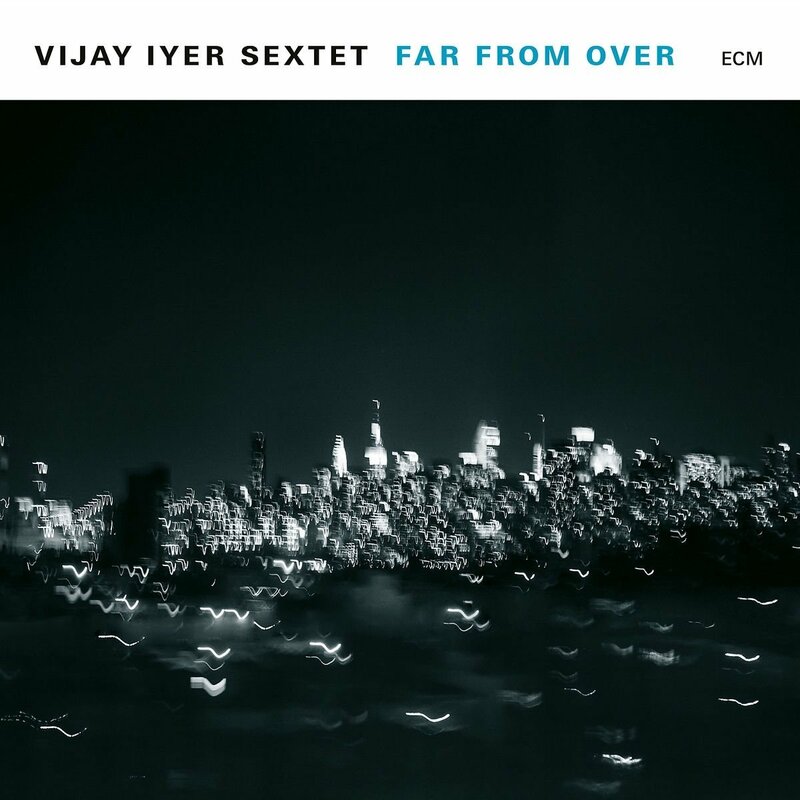 Far From Over, for which Vijay Iyer expanded his trio to a sextet of A-list associates, flows with a dynamic running order, which emphasizes the contours of his writing, the changes in mood and the way his group digs into all of it. Bassist Stephan Crump is aboard, but instead of longtime drummer Marcus Gilmore, Tyshawn Sorey sits behind the kit this time. Alto saxophonist Steve Lehman, the third piece of the Fieldwork trio with Sorey and Iyer, is also on board. Graham Haynes (trumpet, electronics) and Mark Shim (tenor saxophone) complete the group. Iyer can create suspense with the gentlest opening notes, which happens with "Poles." The track is one of those that requires several volume knob adjustments as it takes shape. The horns move together but gradually spread out over the beat, in much the same way the Iyer trio has toyed with the idea of groove. Things get a bit fierce during Lehman's solo, while Haynes calms down during his, and where Iyer shifts to Fender Rhodes. Rather than returning with the whole group, they end on this intriguing mood. Haynes and Iyer work closely on two tracks that almost act interludes between the more complex pieces. "End of the Tunnel" and "Wake," which both include Haynes using echo effects on his horn, recall the spacier moments 1970s Miles Davis. In the former, Haynes does evoke the title, while Iyer's Rhodes resides at the front of the tunnel. Both are tracks relatively brief, but "Wake" sounds like it could have evolved into a longer piece, as Crump and Sorey both add color. But even at 4:47, it presents more intrigue that satisfies. "End of the Tunnel" also acts as the thoughtful break between the laidback funk of "Nope" (listen on earbuds to appreciate the way Sorey is panned between the channels) and "Down to the Wire," where Iyer combines rapid piano figures and some taut rhythms, driven by Sorey. The pianist sounds like he could explode into a visceral attack at any moment, but he keeps things calm but complex. During Sorey's solo, all four limbs work freely, in a manner that sounds totally in keeping with what preceded him in the song. Iyer called some of these tracks "fiendishly difficult" and it can be felt throughout the album. After the maniacal theme of "Good On the Ground," before Shim digs into his solo, there's quick open spot which almost feels like a collective sigh of relief - or triumph really - that the septet made it that far. "In Action" also contrasts a funk backbeat with horn lines falling in odd places, in a manner that recalls Iyer's days with Steve Coleman. But along with the complexity there are moments of beauty, like "For Amiri Baraka" a tranquil piano trio piece. This too comes between "Down to the Wire" and "In Action," another perceptive choice for the running order. "Threnody" begins gently with just the piano trio, eventually bringing in Lehman for a performance that builds in intensity, bringing the album to a passionate close. 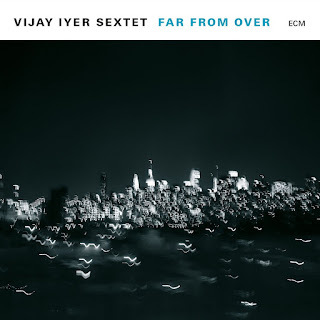 Vijay Iyer has proven himself over the last few years to be a creative composer and performer, not easy to summarize easily. His work has received recognition too, which isn't always the case for artists like him. That being said Far From Over represents that strongest set of material in his catalog so far. While 2009's Historicity has been my favorite of his albums (combining his own work with interpretations ranging from Andrew Hill to MIA and others), this all original set presents a greater perspective of thecreative forces at work in his head.